A trio at our church called "Testimony" (a group which I had previously been a member of years earlier) had sung the song "Heart of Worship" by Matt Redman to a track at church. I had purchased the sheet music to it and really wanted to try my new acoustic guitar out on this song. So, I asked them if they would like to sing it while I played. They seemed to be excited with my offer and agreed. As we discussed this performance, it was suggested that another young adult in our church play the keyboard along with me. This sounded like a great idea, and he agreed to play, so he was recruited. My sister, one of the members of the trio, had just finished a classical guitar class as a requirement to her music degree. Since we had two instruments already, I thought it would be good to add a bass to the mix. Our associate pastor had purchased a bass guitar and amp to use at the church years earlier, but he never had the time to learn. It was just sitting in the music room and was not getting used. So, I suggested that she pick it up and play with us. Since she had just finished a college class on classical guitar, I knew it wouldn't take her long to apply those skills to the bass guitar. After a little persuasion, she decided to take up the bass. I gave her a few quick lessons and she was on her way. Well, now that there was a guitar, keyboard, bass, and vocals ready to perform, we felt like we needed some drums to round everything out (and trust me, we NEEDED those drums). Since I played the drums for the orchestra during our regular services, we already had a kit. But, I was playing the guitar, so I couldn't play them. So, we turned to our church orchestral director, a man of many talents when it comes to music. He agreed to play with us for the performance. Everything was set to go. We performed the song one Sunday night during the special music portion of the service and were very well received. This goes to show you how God can work through you if you are only willing. I know we did not sound like a bunch of professionals, but it inspired our church to see a group of young adults (aside from our over-the-hill drummer :-) letting God use them for His work. Immediately after the performance, we were approached by our music minister. He and the pastor, my dad, had been discussing having contemperary worship songs for half of the service on Sunday nights. We were asked to lead this section of the music. After we talked about it for a little while, everyone agreed to continue playing, but to only lead every other Sunday night due to our lack of experience and great need for practice. So, from that day on, our band continued to play. The three vocalists from Testimony decide that there was no need to keep both groups alive. Our new band assumed the practice schedule of Testimony, and the former group was laid to rest. 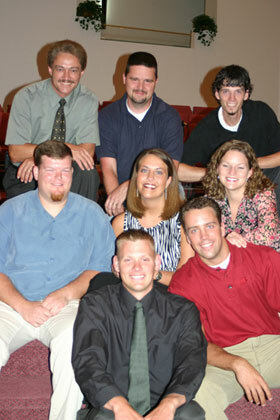 Almost a year after we formed the band, our church hired a new youth minister. He also played a few instruments, one of which was the djembe. This was a new instrument to most of our church as it is mostly heard in african music. But, once he began to play during the services with our orchestra, the church really warmed up to the instrument. Our drummer was going to miss a service where we were to lead worship, so we asked him to keep the band in time using his djembe. After that, he just kind of grew on the band. We kept him as an addition to the band adding congas, bongos, shakers, tambourines, bells, djembe and other world percussion instruments to our sound. Then, after nearly a year and a half of playing with the band, our drummer and orchestral director began to feel out of place with a group of young adults. He decided to step down as our drummer. As God would have it, a new couple had just began attending our church regularly, and the husband was a drummer. He was playing with a southern gospel group who did concerts occasionally, but was really looking to use his gifts for God on a regular basis. It just so happened that, around this time, we were getting several requests to play at events and services. We recruited him to fill in on a three event weekend and he came to our rescue with his performance on the drums. After consulting with each member of the band, I asked him if he would like to become our permanent drummer. He happily agreed to fill the position. This is the band as it stands right now. I know God has truly ordained us to carry out His ministry through music; and I know He will continue to use us throughout our community to not only bring lost souls to Him, but to help usher christians to the throne of worhsip. Lane Ogle - Sound Tech.